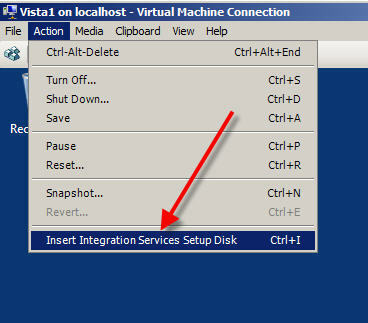 Once you install your Windows Vista guest OS, you will want to install the integration services by going up to Action in the Virtual Machine Connection, and down to Insert Integration Services Setup Disk (as seen in Figure 1 below). You just installed a new OS (Microsoft’s latest desktop OS) and this is telling you that it is unsupported. I will tell you in advance that the fix for this issue is not as easy as you might think. In reality, the desktop OS you installed IS supported. Vista is a supported OS. When it says that “a newer version of Windows is required”, that is somewhat true. You do not need a newer version of Windows Vista. What you need is to patch & update the version that you have. 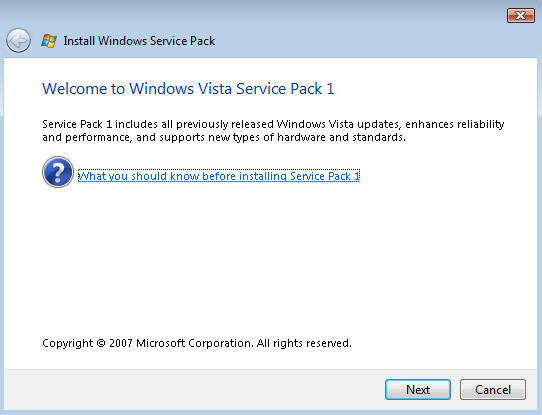 So how do you get the patches downloaded so that they can be applied to your Windows Vista guest OS? Well, you download them from the network or over the Internet, right? However, you have a problem. You cannot connect to the Internet because no network driver for the default virtual NIC is available. You can see the NIC disconnected in Figure 3, below. What do you do to get the needed patches to your Vista OS? Use a virtual floppy? No, the 200+MB Vista SP1 download is not going to fit on a 1.44MB virtual floppy disk by any means. You could also obtain a copy of Windows Vista with SP1 already slipstreamed in the install and reinstall. But you just finished installing your OS, you should not have to install it again. 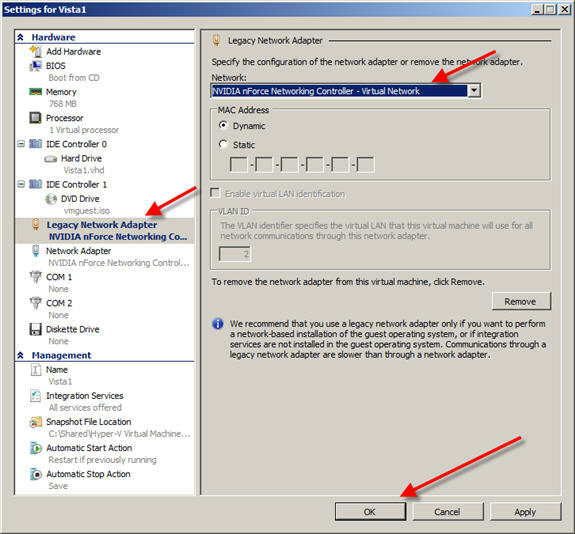 The answer is to add the legacy network adaptor for your Virtual Guest OS. This is a different type of NIC that is supported by the Guest OS without drivers. This will allow you to connect to the network to get what you need. However, you cannot add the legacy NIC while the VM is powered on. 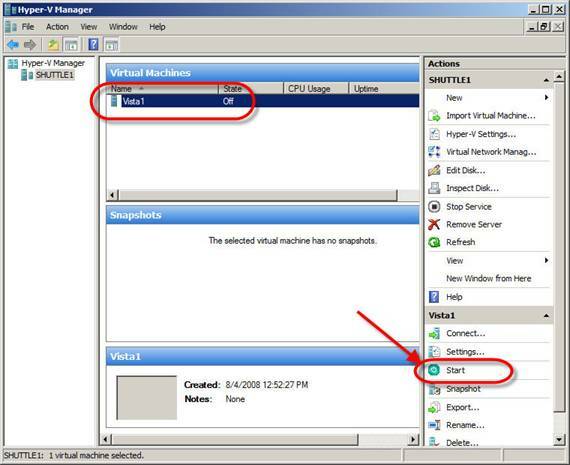 For fun, you can try by going to the Hyper-V Manager and clicking on Settings for that Vista VM (as in Figure 4 and 5, below). 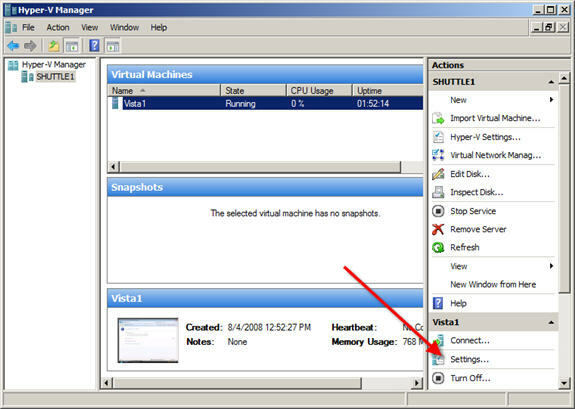 To solve this one, power off the Vista virtual guest. Once that is done, you can then add the legacy network adaptor, as you attempted to do in Figures 4 & 5 (and are now shown in Figure 6 & 7). Once added, you will connect it to a physical network adaptor on the host system. Now, power on (Start) the virtual guest OS (below). Once the virtual guest is booted, you will see the legacy network adaptor was added (as you see in Figure 9). At this point, if you try the integration services application again, it will again tell you that you still need a newer version of windows. However, now that you have the legacy network adaptor, you can access the Internet to download updates. You will need at least Windows Vista SP1. You have a couple of options to get this. You can search the Internet for the download and manually download the installation. Or, you can use Windows Update to download and install it. To search the Internet for a download you can Google “windows vista sp1”. Alternatively, you can use Windows Update. That may take a few passes of downloading, installing, rebooting, waiting for new updates, and repeating the process. Still, it is a good option. 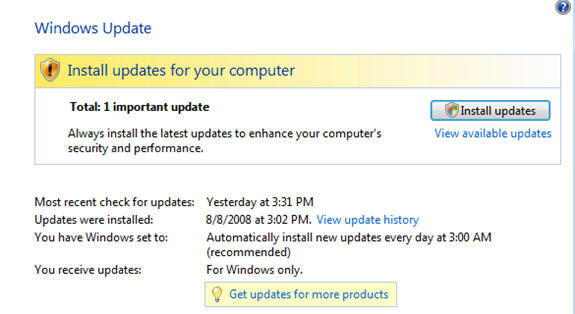 In fact, you may already see Windows Update popping up in the bottom right of your screen telling you that new updates are available for this virtual guest Vista OS. If you click on them, you will see something like Figure 10. In my case, Figure 11 shows that Windows Vista SP1 is available. 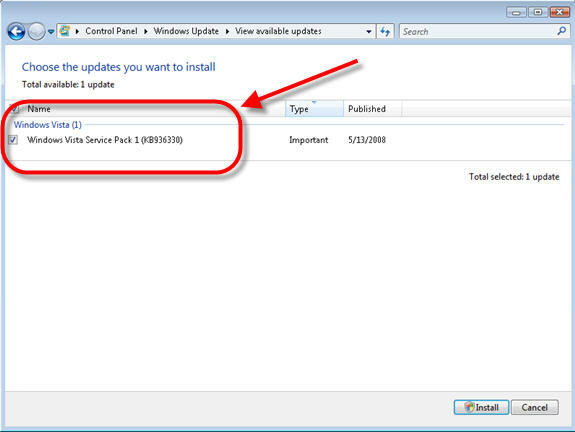 Let’s select to install SP1. 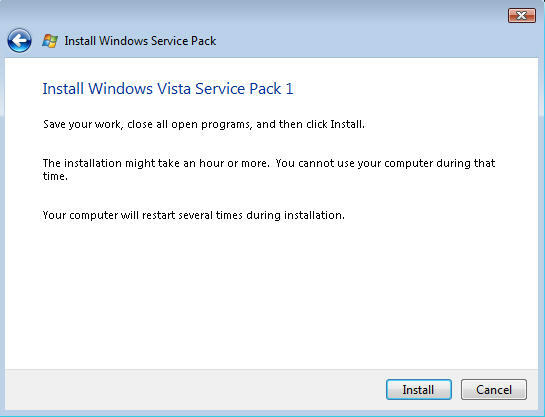 No matter how you obtain and install it, once initiated, the Vista SP1 installation proceeds as in Figures 12 & 13.One or more reboots may be required. 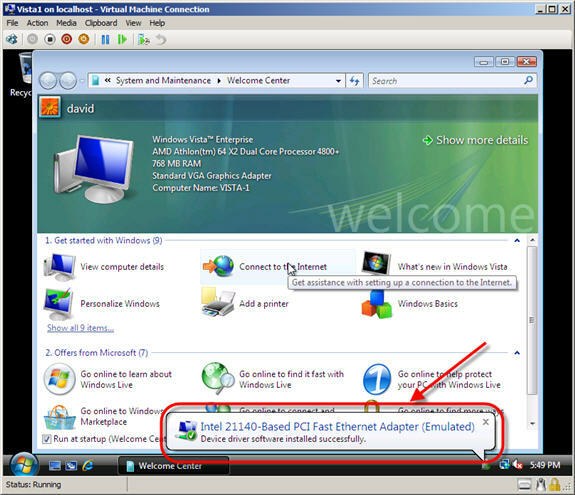 Once Windows Vista SP1 installation (and potential other patches that you install through Windows Update) are complete and your Windows Vista Guest OS has rebooted, you can then initiate the insert integration services disk command from the Hyper-V Manager Actions menu. 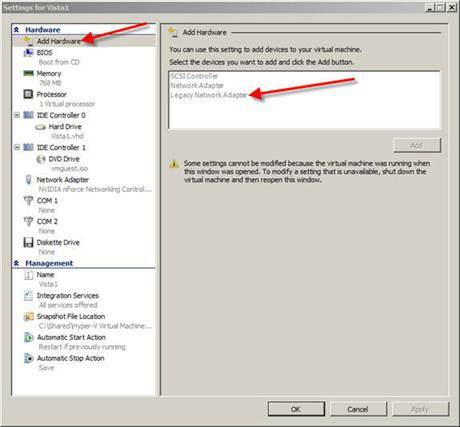 As soon as you do and the autorun of the integration services disk starts, you will see the window shown in Figure 14. 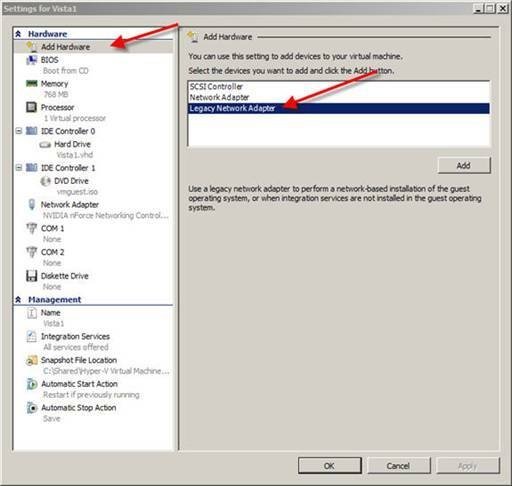 Once the Hyper-V Integration Services installation has completed, you will see the window shown in Figure 15. After answering yes to the question in Figure 16 and rebooting your system, the Hyper-V integration services installation for Windows Vista will be complete! I recommend shutting down the Vista virtual Guest OS and removing the legacy network adaptor, then starting the Vista guest up again.